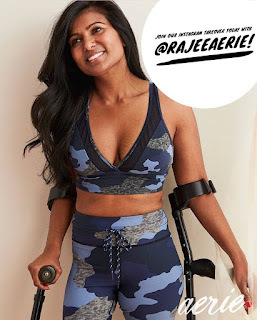 You'd think Rajee Aerie (pictured) was destined to model for American Eagle Outfitters' underwear, swimsuits and leisurewear brand, Aerie, just based on the coincidence of her name matching the brand's. The 34-year-old Chicagoan was in the 2018 ad campaign with a blue camouflage bra and matching leggings. And her crutches. They are visible partners in her role as model – and role model. "If I had these role models or seen this imagery when I was younger, I'd feel like I was more valued and have a better sense of myself," said Aerie, who'd contracted polio as a child in India. "I hope to create that sense of belonging for younger generations, so they know they can aspire to be (anything), no matter who they are." She recalled the pain she endured as a teenager, flipping through magazines and feeling invisible – and contrasted it with her elation upon hearing she'd landed the gig and later, scored a billboard in Times Square. She was among a slew of young women included in the Aerie brand's advertising who aren't traditionally seen as models, including individuals with a wheelchair, an insulin pump and an ostomy bag. A growing number of advertising and marketing efforts are showcasing a wider variety of beauty. The trend stretches from the 2018 Gerber baby, Lucas Warren, who has Down Syndrome, and Target's new swimsuit model Kiara Washington, who has a prosthetic leg, to Diandra Forrest, who has albinism, modeling for the cosmetics company Wet 'n Wild, and Jillian Mercado, who uses a wheelchair, posing for Nordstrom. When 18-year-old Evelyn McConnell saw photos of model Abby Sams, she was both shocked and excited and immediately shared the images with her friends on social media. She saw herself reflected in the Aerie ad featuring Sams, who uses a wheelchair like she does. "It's very much changed my perspective of them as a business," said McConnell, a high school senior from Altoona, Pennsylvania. "Just seeing that this business supports people with disabilities and presents us as models, it meant a lot of me." This increased representation in both product packaging and promotion comes as other forms of inclusivity, such as diverse ethnic backgrounds and body types, have begun to take hold. In the same way, we are seeing more LGBTQ couples and multiracial families in ads, images of all sorts of people are now front and center on store shelves and in ads. Broadening the definition of beauty comes down to sales strategy. Create enough buzz with innovative images, and the companies get attention. Brand awareness kicks in when people go shopping and choose where to make their purchases, what the industry calls conversion. "Advertisers want to sell, but they’re thinking about the broader image," said University of Illinois at Chicago marketing professor David Gal. "It's not just 'This ad will lift sales X percent.' They want the brand perceived as progressive, cutting edge, different. Ultimately, it will help the bottom line." The potential to resonate with consumers not used to seeing themselves reflected in advertising and on packaging is huge. More than 40 million Americans have disabilities, according to the most recent U.S. Census numbers – but that number doesn't include the millions more who have illnesses, such as dermatological and autoimmune diseases, and use assistive medical equipment. "The message with that was everyone should embrace their real selves. This is our community. This is real women, so represent yourself," said Aerie's senior vice president of marketing, Stacey McCormick. "Using real women regardless of size, ability, disability, the customer feels more connected to these images, which increases conversion, which increases sales." Inclusive advertising and packaging help companies appeal to a diverse customer base and be viewed as socially responsible, according to Gal. "Part of it is ethnic diversity has already become the baseline to be relevant for a lot of advertisers and marketers. They’re saying, 'What is the next area to push the envelope?'" he said. "They're looking for new ways to differentiate themselves and show they’re ahead of where their competitors are in terms of being progressive." While the move to more mainstream print modeling is relatively new, TV ads have been more of a pioneer. The biggest early splash likely came from the Diet Pepsi ad in 1991 featuring legendary musician Ray Charles, who was blind. Since then, other examples include the Apple ad in 1995 featuring actress Marlee Matlin, who is deaf; the 2014 Duracell commercial starring NFL player Derrick Coleman, who also is deaf, and last year's Doritos Super Bowl ad, starring actors Morgan Freeman and Peter Dinklage, who has dwarfism. Most recent is the package of the newest cookie to join the Girl Scouts line-up, gluten-free Caramel Chocolate Chip, which debuted earlier this month. The front features three girls playing together and at the center of the smiling trio is Nicklya Brantley, who has vitiligo, a disease that causes patches of skin to lose their color. "We’re trying to convey that girls come in every size, every shape, from every community," said Lynn Godfrey, the organization's chief marketing and communications officer. McConnell, the teenager, said she hasn't made it to Aerie at the nearby Logan Valley Mall but plans to go soon. She views supporting the brand as a way of fighting ableism, discrimination against people with disabilities. And she doesn't care what's motivating this and other ad campaigns; she prefers to focus on the bigger picture. "It's absolutely something they have done to serve their company, but at the same time, it benefits not only the models with disabilities who are getting paid and being seen (but) especially young girls with disabilities who are able to see themselves," McConnell said. "Even if it doesn't come from a genuine place, it’s still helpful."